There, Lane encounters a girl he knew years ago. Instead of the shy loner he remembers, Sadie has transformed. At Latham, she is sarcastic, fearless, and utterly compelling. Her friends, a group of eccentric troublemakers, fascinate Lane, who has never stepped out of bounds his whole life. And as he gradually becomes one of them, Sadie shows him their secrets, how to steal internet, how to sneak into town, and how to disable the med sensors they must wear at all times. Lane had it all. Loving girlfriend, doting parents and a bright future. But now the seventeen year old has incurable tuberculosis, deadly and contagious and finds himself as the newest resident of Latham House, a wellness hospital where students can continue their studies while waiting for a cure. Or death. Only recently diagnosed, Lane is determined not to put his future on hold and still dreams of Standford where he is all but guaranteed his entrance. But Latham prides itself on providing a stress free environment, healthy meals and support while research attempts to find a vaccine and cure. With varying levels of illness, the patients seem so full of life and none more so than Sadie. Sadie is one of the longest residents at Latham, she's vivacious, sassy and runs the internal racketeering scheme. But she and Lane share a history, and Sadie still holds a grudge. But when Lane starts to realise that his illness is beginning to take hold, he learns that there is more to life than maintaining his grade average and college. Along with Sadie and her group of friends, Lane begins to truly live each day as it were his last. Because it may very well be. Extraordinary Means was a phenomenal, hopeful and emotional read, following the lives of both Lane and Sadie and their battle against an incurable strain of tuberculosis. Told in dual points of view, Lane is a new admission at Latham House, while Sadie is a permanent fixture at the hospital slash school. Both share a turbulent history, but each have their own dragons to slay while they form a tentative friendship. Each student is suffering from the same condition, but in varying degrees. Teens learn to live with the disease, remain healthy while still maintaining a sense of their former life. But it's not enough for Lane the overachiever. His one link with the outside world has betrayed him, so he retreats to his studies, trying to maintain his grade average while his illness begins to take over. Then he meets the effervescent Sadie. Sadie is the vision of health. She's loud, vivacious and full of life. Lane is drawn to her infectious laugh and starts to reassess his time at Latham house, to survive the stay until a cure is found. But as the two become closer, they begin to realise that there is only one way in which the group will be leaving Latham, by miraculous cure or by dying. It was simply beautiful, emotional and written with such care of hand for those effected by a terminal illness. The underlying message of Extraordinary Means is one of hope, and learning to live in the face of adversity. This isn't another story of teens grappling with dying, but making the most of what little time they may have left. Robyn Schneider is nothing short of magnificent, spinning a tender tale of life in it's purest form. Learning to love, learning to live and learning that life is too short not to make the most from the hand you've been dealt. I didn't even know that Robyn Schneider's got a new book! I loved her other book, The Beginning of Everything, and based on your thoughts, I think I will like this one. Robyn has a way with words, and her geeky references in TBoE was great. I haven't read a book that tackles TB, so this should be very interesting. She certainly does. Realistic and beautiful. I absolutely adored this Dre and looking forward to checking out her other books now too. I don't think I've seen any other young adult that even mentions tuberculosis, we probably won't again any time soon either. I can't wait to see what you think of it. Oh Rabiah, you'll absolutely adore it. So much more engaging than anything John Green could produce. It was so incredibly lovely. Looking forward to seeing your thoughts. This sounds absolutely heartbreaking and beautiful. Will definitely have to add it to my TBR. Lovely review, Kells. Thanks poppet. It was gorgeous and so beautifully written as well. Definitely one to move up your list and read it sooner rather than later. It was incredible! Emotional, but it also has bursts of fun, laughter and silliness too. Not only the main characters, but I loved their circle of friends as well. I can't wait to see what you think of it. I really REALLY can't wait until you read it too Frannie. It's absolutely beautiful. There's so many incredible young adult contemporaries out this year and for me, this is one of my favourites. This just sounds so happy, sad, delightful, funny, and absolutely heartbreaking. Did you shed tears?? But I'm glad to see that it's not about teens facing death, but just making the most of their lives. That in itself is really sad to think about, but I guess all you can do is be optimistic about it! Thanks poppet. I cried. I was teary quite a few times actually. But it was so incredibly beautiful. But I love that their illness wasn't romanticised though, which only added to the realism. I can't wait until you read this one, no doubt you'll love it as much as I did. This sounds heartbreaking and I'm not sure if I have the guts to go into it. Glad to see you enjoy it though, it does sound amazing. I also adore the cover. Oh no, it's well worth reading regardless. It's beautiful Mari, you'll really enjoy it. The Australian cover is absolutely stunning isn't it, much nicer than the US version. Oh wow, I wouldn't have even paid this book any mind if I just saw it in passing. It actually sounds like a great read. It's a wonderful read Christy. Really lovely and heartfelt. I'd love to see more bloggers grabbing copies and giving this one the praise is really deserves. Did you say Dragons? Uprooted is another one on my list that I need to purchase and read. Too many books and nearly not enough time. But this! This book is everything smushy. You must read it after you dragons. I insist! I'm not surprised Kara, it's brilliant. I was so immersed and couldn't help but emotionally invest in it. The characters, the hospital. This is definitely one I'll read again and again. Thanks Blessie. I can't make any promises, but you might need the tissues. I fact, stock up on a few boxes. It's absolutely lovely though. I enjoyed it far more than The Fault in our Stars. I can't wait to see what you think of it. Yay! I am so elated this one made up for the previous letdown (Me Being Me Is Exactly as Insane as You Being You). Dual points of view are a hit and miss for me, I often find my emotions struggling to connect with the different seqence of events. It sounds to me as though the author towered over this aspect in writing though, since you gave it such a glowing review. I just recently finished reading a contemporary novel that more than tickled my feels, I'll have to list this one for a later read though! I love well-rounded emotional narratives; that's for sure! She did a fabulous Job Claudia. Being able to experience both their illnesses from their respective points of view really added to the emotion of the storyline. But under the sadness, there are certainly more moments of fun, laughter and mischief. I absolutely loved it. It sounds compelling, I have to ask though, did you cry? I did Claudia. Not great big heaving sobs, but I was so incredibly teary, and more than one. It was just so lovely though. I haven't even heard of Extraordinary Means before! It does sound really interesting, though. I'm generally a huge fan of multiple POVs, so this might be one to check out for me. Thanks for the lovely review! It's brilliant Jessica. I think this will appeal to all young adult readers, especially John Green fans. I've been trying to find your blog poppet, but you haven't linked to it on your profile. You've been on a quite a good streak, lately! Kinda jealous :D I've read her previous work. It sounds like she'll put me through another wringer, but I'm more than happy to go along with it. Lovely review, Kelly! Thanks Joy. This was my first of her releases, but it certainly won't be my last. I loved it. It was just beautiful. Going to check out her previous releases and grab a copy. Such a remarkable author. Man, Kelly, your reviews are just so poignant and so beautiful. I don't think I can ever write as beautiful as you O_O This review already made me tear up because of the possibility of finding something so beautiful even in near death or in the midst of a terminal illness. Will I survive this book, Kelly? WILL I? Or am i going to drown in my tears? Aww, thanks Faye. It's not hard when you've got wonderful books like this one to review though, they practically write themselves. I won't lie, you'll cry. Multiple times. But it's not all sadness, doom and gloom. It's so incredibly charming and funny. You'll adore it Faye! It's certainly emotional Aimee, but well worth the read for all the feels! Add this one to your list, it'll stay with you long after you turn that final page. Oh, the story behind this book sounds simply beautiful! I love how it circles around hope rather than anything else, even though a terminal illness is hard to cope with. Lovely review! It was so surprising Jeann. I expected the typical teen illness read, but it has real heart and so lovingly written as well. It was beautiful Wattle, and so incredibly emotional too. I adored it. 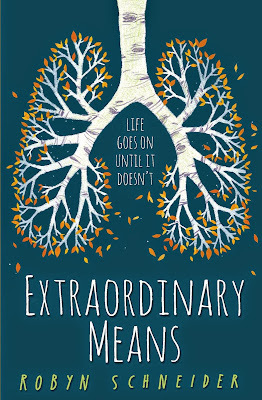 It reminded me of a John Green novel, but far more original and superbly lovely. Wow, this book sounds beautiful and it looks like exactly my kind of book! I have a huge soft spot for emotional and strong contemporaries, and I just added this to my TBR. Thanks for the rec Kelly! Thanks Mishma. It really is so incredibly lovely and one of those emotional reads that stays with you long after you've finished. Looking forward to seeing what you think of it. Thanks Zoe. It was very John Green like, but I think it was written with much more emotion and not romanticised the way he generally takes on illness. I loved it. So incredibly beautiful and I loved the little touch of lyricism woven throughout too. Brilliant review. I read her other book and really enjoyed it, so I am definitely excited to get to this one. It seems like a really wonderful story and I think it's going to really hit me in the feels - which I think I am totally in the mood for a heartbreaking book. I haven't read any of her other titles yet Charnell, but have it down on my to purchase list next time I put in a book order. If it's even half as awesome as this was, I know I'll completely fall in love. She's such an amazing author. I've never read a Robyn Schneider book and this one is sitting on my shelf so I definitely need to get to it soon! It sounds like something that would be right up my alley. Thank you for the amazing review as always!